There is no doubt in fact that WhatsApp is one of the most popular and even most loved messaging apps. It is a great platform to chat with your friends and family members. Now you can also make voice and video calls on this app. With every new update, WhatsApp is loaded with so many new features. You might be using WhatsApp from a long time but still there are many things you don't know about this amazing app. For example, you can use bold, italic and strikethrough text in chat messages. 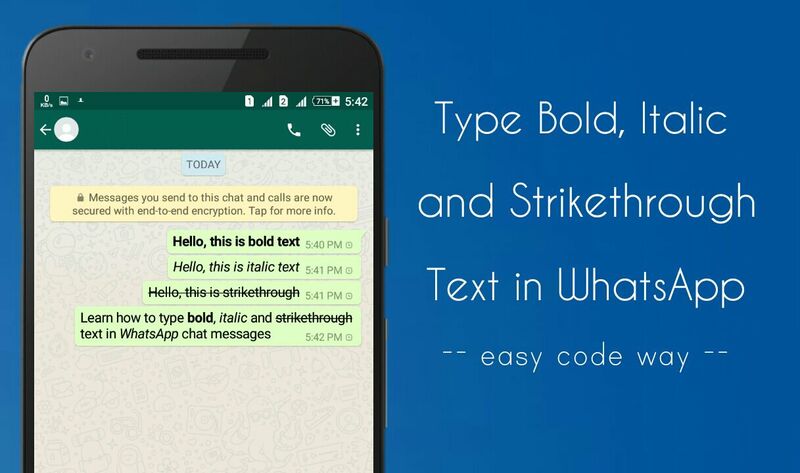 Here I will guide how to type these stylish fonts in WhatsApp on Android and iPhone. First launch the WhatsApp app in your phone and open any chat to whom you would like to send a message. 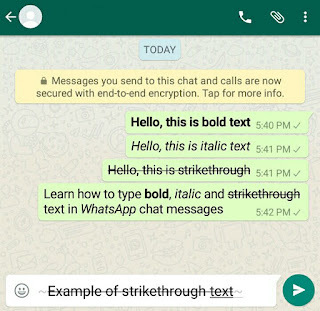 Similarly you can type strikethrough text in WhatsApp chat messages by adding tilde "~" symbol before and after the text as shown in the below picture. Note: Strikethrough is a typographical representation of words with a horizontal line passing through their centre. It is usually used when you want to edit what you've written earlier, without removing the original text. Once you have typed your message, just click the Send button and that's it. On these websites, you just have type the text in the given field and then select the desired font you want to use. 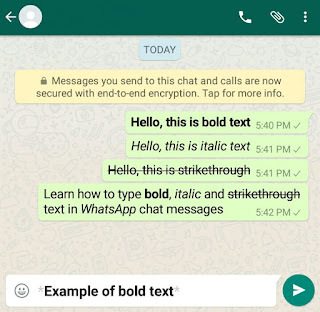 After that, copy the generated text and paste it in the WhatsApp chat box. That's it. If you would like to ask something about this tutorial, fell free to share it in the comments below.